Join the discussion on our forums! Come discuss The Boomship over in our dedicated The Boomship discussion topic. Love this card in recruit warrior! maybe not the best deck out there but it's so satisfying pulling out The Lich King and two Sleepy Dragons against an aggro player and seeing them concede on the spot. Edit: this was supposed to go under a comment. Why did it show up here? Just pulled this card, could I make it the center of some type of budget warrior deck? It can go in Mecha'thun Warrior if you are okay with losing...a lot. Does alright against aggro though. This card's animation is so dope! They have Rush, not charge, so you can't OTK. The OTK version is with Mecha'thun and Malygos. Clearly goes in a recruit warrior deck. So this is a 2 if recruit warrior is bad and it's a 4/5 if recruit warrior is a thing. With all the new magnetic Mechs you could summon something truly insane and board turning. That's not how magnetic works. Magnetic is like a battlecry effect. 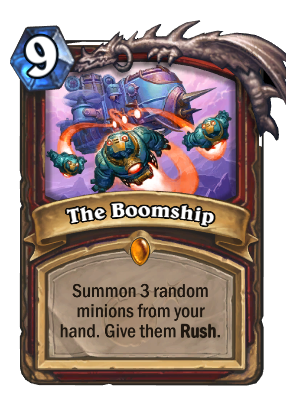 This will just pull 3 of your mechs and not do anything else. "It is a legend no one will forget.."